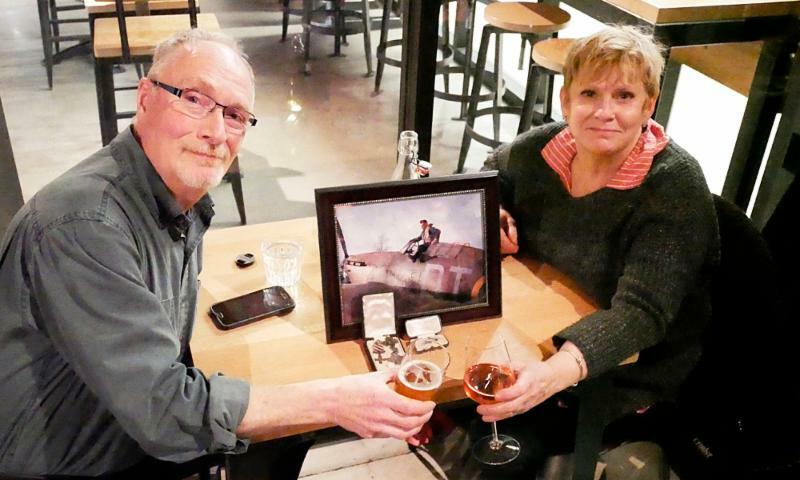 AAM Communications Coordinator Steve Finkelman and Pat Barford, Howard Blatchford's niece, share a toast to the famous WWII ace. 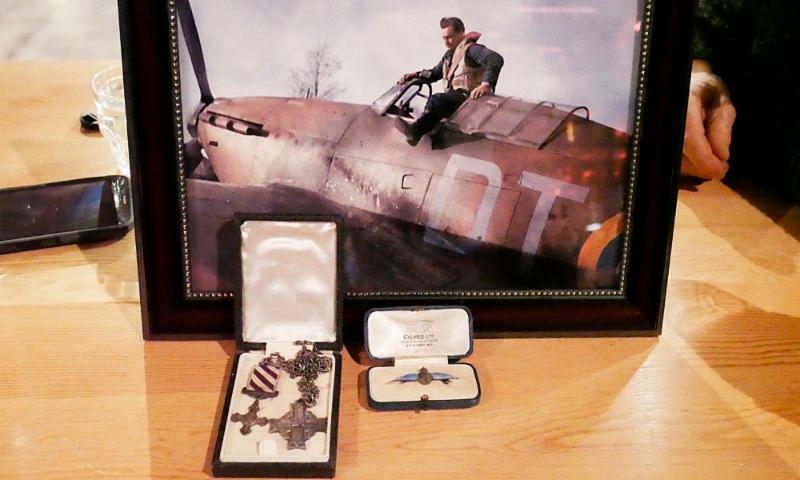 Howard Blatchford's medals donated to the AAM, a miniature Distinguished Flying Cross (DFC), a Memorial Cross and a miniature set of dress uniform flying wings. 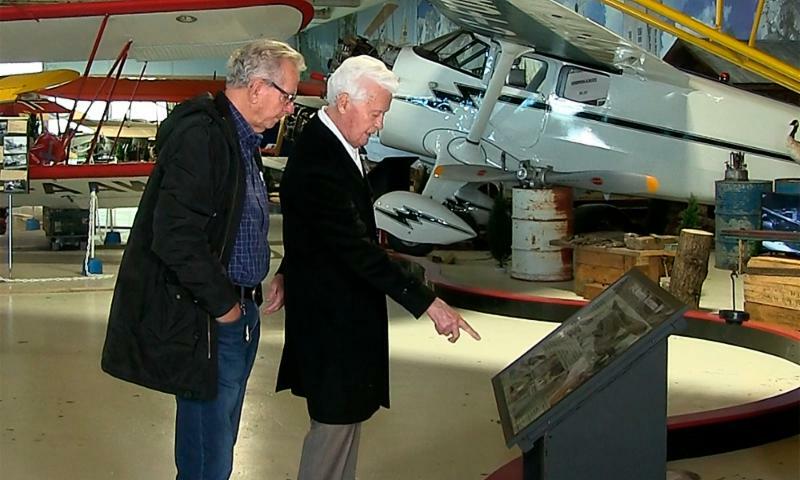 The goal of the Alberta Aviation Museum is to keep Edmonton's aviation history alive. We are delighted to receive several important artifacts from some of the city's flying legends to help us do that. Howard Peter Blatchford was a World War II fighter ace from Edmonton who flew during the Battle of Britain. He was shot down and killed in 1943. At the time of his death he had recorded five aircraft destroyed, three shared aircraft shot down and three "probables." He also scored the first victory by a Canadian pilot during the war. The Blatchford name should be familiar to all Edmontonians. He was the son of Kenneth Blatchford, a former mayor of Edmonton and an early promoter of aviation. Blatchford Field was named in the former mayor's honour. Pat Barford, Howard Blatchford's niece (and granddaughter of Kenneth Blatchford) uncovered some of her famous uncle's World War II medals and has donated them to the museum. They include a miniature of the Distinguised Flying Cross (DFC) Blatchford was awarded for a December 1940 mission in which his squadron shot down eight enemy aircraft and damaged a further five. The official commendation reads, "In the course of the combat he rammed and damaged a hostile fighter when his ammunition was expended, and then made two determined head-on feint attacks on enemy fighters, which drove them off. He has shown magnificent leadership and outstanding courage." Barford has also donated a set of enamel Flying Wings and the Memorial Cross presented to Blatchford's mother after his death in combat. "Howard Blatchford was an Edmonton guy," says Barford, who is pleased to give the artifacts a permanent home at the AAM. "I am happy to see him recognized in his home and to have his stuff in his home where he grew up." 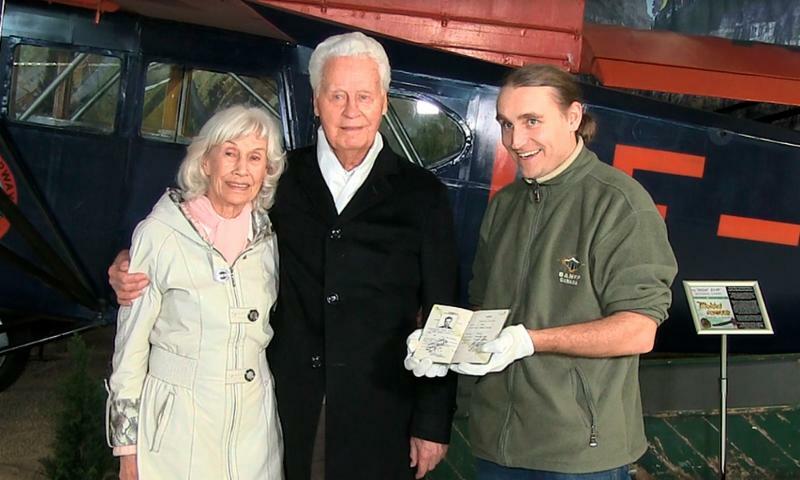 Max and Marjorie Ward donating his 1946 commercial pilot's licence to AAM Curator Lech Lebiedowski. Ward and long-time friend and former Wardair mechanic Guenther Moellenbeck check out the Norseman display during their recent visit to the museum. Max Ward is another local aviation legend who needs little introduction. His commerical flying venture started after the war with one biplane and became Wardair, Canada's third largest airline flying passenger jets on international routes. Ward has donated his first commercial pilot's licence, granted in 1946, to the museum. Ward and his wife, Marjorie, now 96 and 95, were also gracious in granting us interviews for our Blatchford Tales Oral History Project. As well, we are digitizing dozens of scrapbooks kept by Marjorie Ward detailing a year-by-year record of their aviation company. "Its one of the most important local stories that has been practically untold and unpreserved," says AAM curator Lech Lebiedowski. "This story is not only local, not only national, but international. The memories of Wardair endure and they should be collected and that is what we are starting to do right now." Both the Blatchford medals and the Ward flying certificate will eventually be on display as we continue to update our exhibits to better tell these important stories to the public. 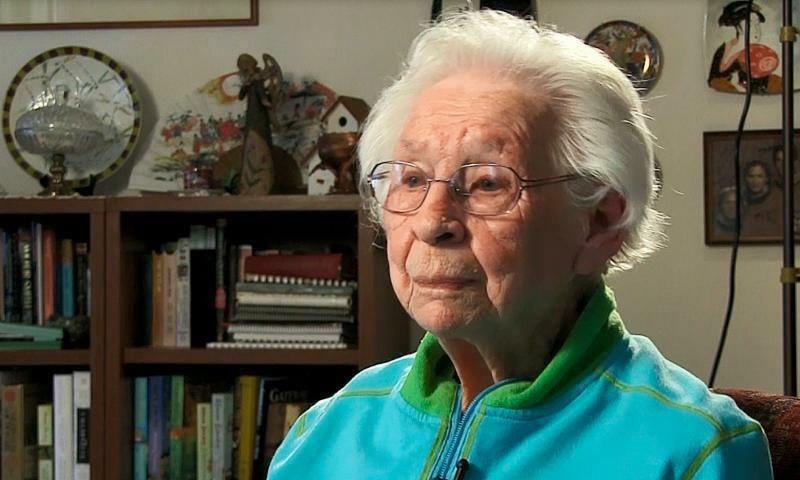 Annie Shortill has been around aviation in Edmonton for most of her 102 years. "My first date (in 1934) was sitting under the wing of an American Eagle (biplane,)" she said during an interview for the Blatchford Tales Oral History Project in 2014. "My husband (to be, Howard,) was selling rides at one cent a pound for a trip around the city. And almost every Sunday after was to Blatchford Field." The couple continued to be great aviation buffs, meeting many of the early aviation pioneers including airport manager Jimmy Bell and airline entrepreneur Grant McConnachie. Shortill shared her husband's love of all things aviation. "They rather excited me and appealed to me. Just seeing it taking off and seeing what it could do...like a flying bird." Although her husband was medically unfit to fly, he did join the military working as a truck driver with units of the British Commonwealth Air Training Plan, which trained hundreds of thousands of pilots for the war effort, both in Alberta and at bases across the country. After the war the couple continued their involvement with aviation. For a time, Annie Shortill worked in the kitchen of the Edmonton Flying Club. She and Murray were among the group of enthusiasts who laboured to get an aviation museum started in Edmonton in the 1980's. Ten years later, when the museum moved to its present location, she was a constant presence at Hangar 14 as a volunteer. "Shortill supported all the fundraising things that we did." remembers Barb Cloney, who worked for the Edmonton Aviation Heritage Society in the hangar. "Raffles in particular. She would always provide the afghan and the mitts and the scarfs and she made them herself." To many in the aviation community in and around Edmonton, Mike Poworoznik's Fathers Day Fly-in at his farm strip near Morrinville was a "must attend" event. 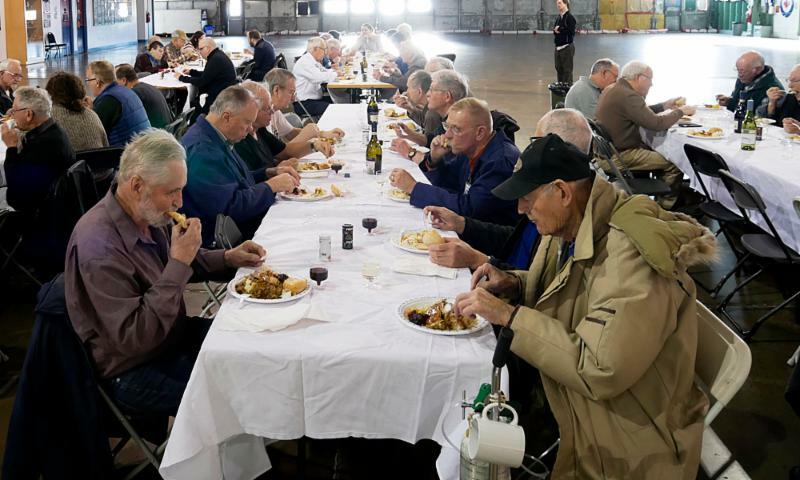 The Poworoznik family and friends fed upwards of 200 people and hosted dozens of airplanes. The fly-in was an annual event for more than 30 years, and it was all free. Poworoznik wore many hats during this career; mechanic, farmer, rancher, grave digger and school bus driver. But his real love was aviation. He learned to fly in 1964. His farm strip was built 10 years later. There were always numerous aircraft being flown or under construction at the family airfield. Eventually, Poworoznik caught the "ultralight bug," and began selling and instructing in the tiny aircraft. Many ultralight pilots in the region owe their love of light aviation to his enthusiasm for the sport. 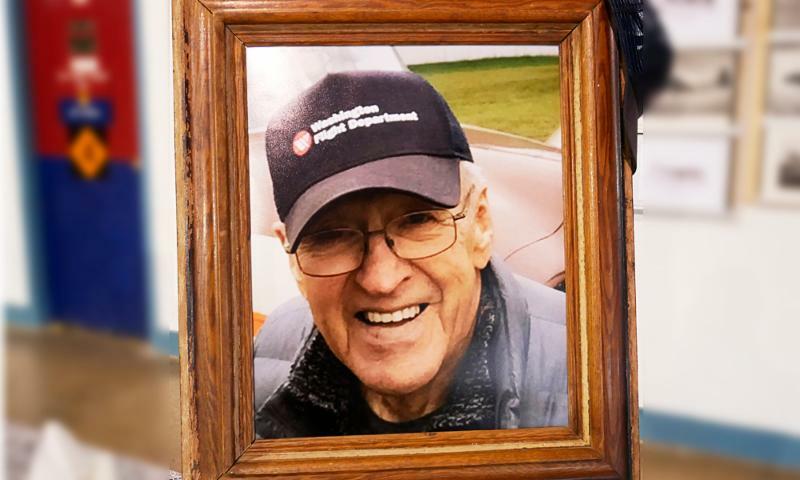 Poworoznik was a life-long member of the Alberta Aviation Museum and we were pleased to offer space to the family for their father's memorial Tuesday November 12. About 150 came to pay their respects to a friend, mentor and fellow aviator. It was no co-incidence the event was held on a Tuesday. Poworoznik was a regular among the old-timers who gather at the museum canteen every Tuesday for lunch, coffee and to swap stories. Our condolences to the families and friends of both Annie Shortill and Mike Poworoznik. As we move into the Christmas season we are celebrating some traditions of our own. On December 5 we held our annual Volunteer Christmas Lunch. 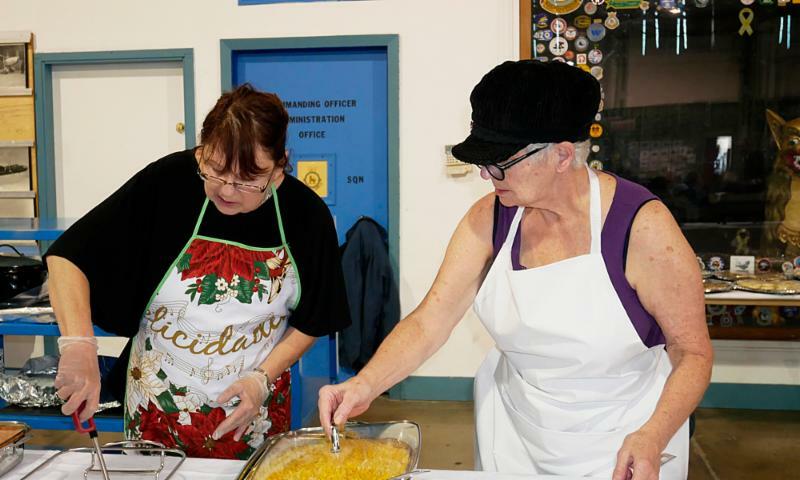 Dozens of those who donate their time to help us make the museum what it is were treated to a turkey dinner with all the trimmings.Our thanks to 418 Squadron Association for providing with the food, especially Linda Forbes and her team, who prepared such a festive meal. Another regular tradition is our gift shop sale. Items at the store are 20 per cent off until the end of the year, with T-shirts 40 per cent off. Be sure to stop in to complete your gift list for that aviation enthusiast in your family. 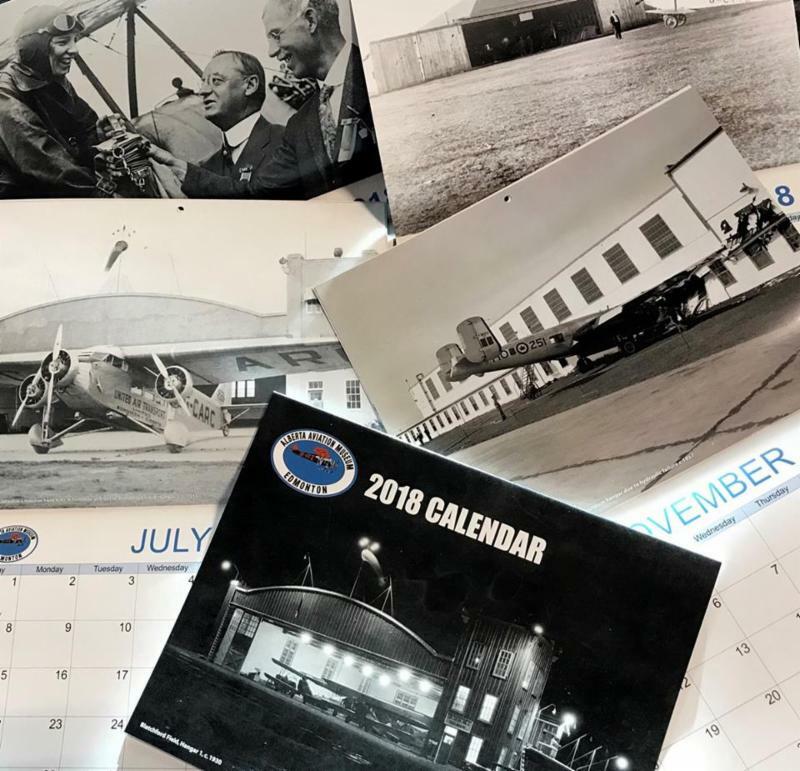 And don't forget to check out our new AAM 2018 calendar with historic images of Blatchford Field on sale for $22.50. And we are also remembering those who are not as fortunate. From December 13 to 20, we are offering half-price admission to all those who bring a non-perishable item for the Edmonton Food Bank. We will also be offering a Christmas-themed kid’s drop-in program on Sunday December 17. It’s designed for children ages 2-6 and runs from 1pm to 2pm. The program is free with regular adult admission. This will be the last drop-in program for the year. We will resume again in the new year. Watch our Facebook page for dates and details about the programs. And remember, the museum is open during the holiday break and it’s always a good place to bring the family for a fun and educational activity. Note: The next issue of From the Hangar will be published Feb 1. We wish all our volunteers and supporters a happy holiday season. December 28, 5pm to 8pm. Servus Community Access Night. This free event is your chance bring the whole family to see what the Alberta Aviation Museum has to offer. Thanks to Servus Credit Union for their support for this great program. See more about Servus' community program support here. January 11, 7pm-9pm. AAM Lecture Series: Winged Mounties, a history of the RCMP Air Division. AAM Board Member Jack Van Norman spent most of his 32 year career as a Mountie serving in the Air Division flying everything from Beavers and Otters to Citation jets. 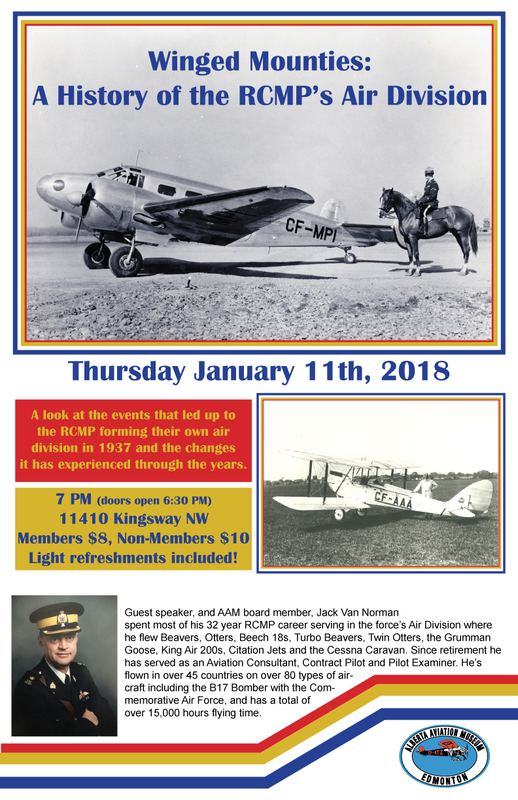 He will discuss the RCMP's 80 year history of using airplanes to police our vast country. Members $8, non-members $10. Light refreshments included. Doors open at 6:30 pm.